Peas – my family can’t seem to get enough of them. 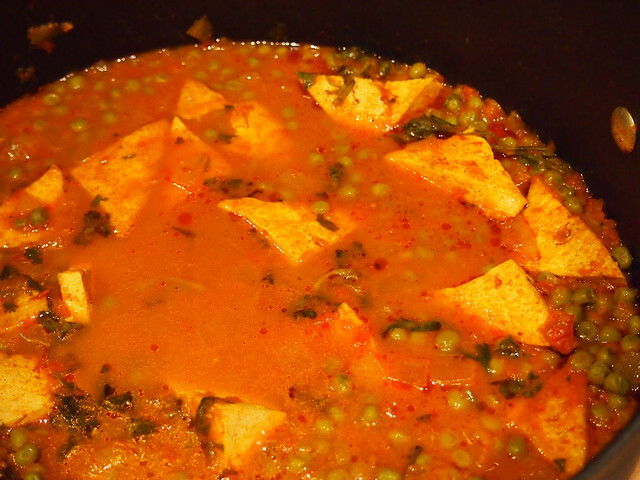 Here’s yet another rendition of Mattar Paneer, this time with chewy triangles of pan fried tofu. 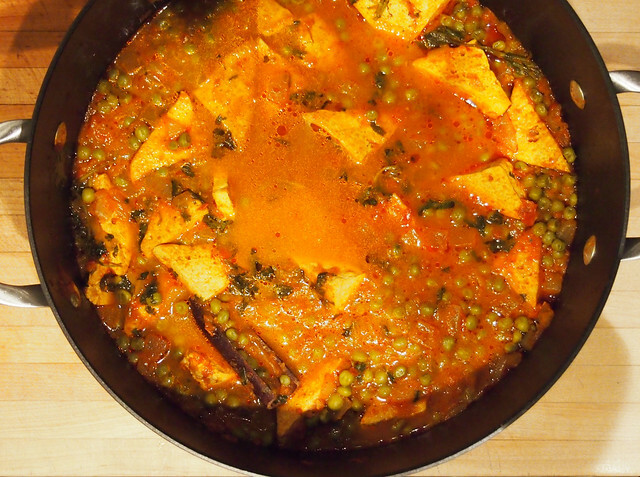 For other variations, try Matar Mushroom (Peas and Shitake Mushrooms) and Matar Paneer with Grilled Paneer (Peas and Grilled Paneer, a Farmer’s Cheese). To get chewy triangles of tofu like these, take a block of store bought tofu and gently press the water out between two paper towels. Placing the long side of the block closest to you, make four equally spaced out vertical cuts with a sharp knife through the block. Cut each of the four pieces in half lengthwise. Then cut each half diagonally so you have a total of twelve triangles. Cut each triangle in half (so they are half as thick). Pan fry in canola oil flipping so each side becomes golden. How do you make the curry part?